Castle in the Sky EOPM is provided for you and if you think it can be optimized such as adding the dynamics etc, welcome to provide us with the more perfect Castle in the Sky EOP and EOPM! 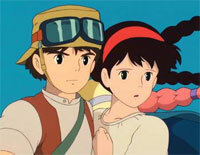 Castle in the Sky is a piece of music composed by Joe Hisaishi. Joe Hisaishi (久石 譲Hisaishi Jō), is a composer and musical director known for over 100 film scores and solo albums dating back to 1981.